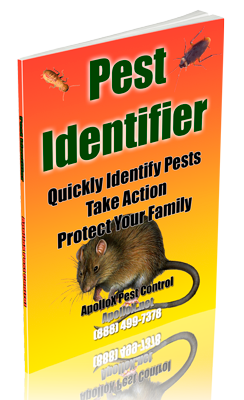 ApolloX Pest Control will remove powderpost beetles from your home quickly, efficiently, and safely. Powderpost beetles are wood-boring insects which reduce wood to a fine, flour-like powder. They can be serious pests of structures. The larvae of these beetles live in and consume dry, seasoned wood. The most common types of powderpost beetles are Anobiid, Lyctid, and Bostrichid powderpost beetles. Anobiid powderpost beetles are usually about 1/16 to 1/4 inch long and reddish brown or grayish brown to dark brown. The body is cylindrical, elongated and covered with fine hair. The head is covered by the pronotum from top view. The last three segments of antennae are usually lengthened and broadened. The larvae are white, C-shaped grubs with rows of small spines on the dorsal side. Bostrichid powderpost beetles are 1/8 to 3/4 inch long and reddish brown to black. Their bodies are elongated and cylindrical with a roughened thorax. Heads are concealed by the pronotum from above. The antennae are short with three or four enlarged, saw-toothed terminal segments. The larva is white and C-shaped with no spines on the body. Lyctid powderpost beetles are about 1/4 inch long and brown. The body is elongated and slightly flattened. The head is prominent and not covered by the pronotum. Antennae have a two-segmented terminal club. The larvae are white and C-shaped, with the eighth abdominal spiracle enlarged. Since powderpost beetles are mostly active at night and tunneling and development of the larvae takes place entirely below the wood surface, the only signs of infestation are the emergence holes made by the adults and the powder-like frass sifting from the holes. The small circular emergence holes made by lyctid powderpost beetles are about the diameter of a pinhead whereas exit holes made by android powderpost beetles are slightly larger. One way to differentiate holes of the two species is to insert a “click-type” (refillable) ball-point pen into the exit hole; only the tip of the ball will fit through lyctid powderpost beetles emergence holes. If the hole was made by anobiid powderpost beetles, the tip of the pen will enter part-way up the angled face of the point. For bistrichid powderpost beetles, the round emergence holes are 1/8 to 3/16 inch in diameter. Another way to differentiate powderpost beetles is from the consistency of the powder (frass) that sifts out of the exit holes. Lyctid powderpost beetles frass is extremely fine and feels like talc when rubbed between the fingers. Anobiid powderpost beetles frass is also powder-like, but feels gritty. Bostrichid powderpost beetles sawdust-like frass sticks together and is found tightly packed in galleries but not in entrance holes. Most commonly, infestations of Anobiid powderpost beetles are found in structural timbers made of softwood, such as beams, sills, joists, studs, sub-flooring and plywood. In addition, anobiid powderpost beetles will infest hardwood furniture, wall paneling, window and door molding, hardwood floors, and furniture. Woods such as maple, beech, poplar and pine are especially susceptible to attack. Anobiid powderpost beetles prefer to infest wood with high moisture content in poorly ventilated areas in crawl spaces of houses, utility rooms, and garages. Under favorable conditions, the infestation then spreads into walls and other areas of the structure. Infestations develop slowly, but wood can be re-infested year after year. The anobiid powderpost beetles’ life cycle lasts one to 10 years, depending on the species. The life cycle of bostrichid powderpost beetles is one year. Bostrichid powderpost beetles infest seasoned softwood and hardwood, especially unfinished floors, window sills, and furniture. Bamboo items are especially susceptible to attack by some species of bostrichid powderpost beetles. Lyctid powderpost beetles infest the sapwoods of hardwoods — mainly ash, hickory, oak, maple, and mahogany. Consequently, most infestations are found in wood paneling, molding, window and door frames, hardwood floors, and furniture. Imported tropical hardwoods are especially infested with lyctid powderpost beetles because of poor storage and drying practices prior to shipment to the United States. Joists, rafters, and sub-floors of houses are not usually infested with lyctid powderpost beetles, because they are usually made of pine or other softwoods. Lyctid powderpost beetles rarely infest wood older than five years. Therefore, infestations are usually in new homes or newly manufactured articles. Infestation usually results from wood that contained eggs or larvae at the time of purchase. This beetle’s life cycle is six months to four years. Lyctid powderpost beetles presence is overlooked until they are discovered in stored lumber, rafters, joists, finished wood, and furniture products. As a rule, they enter lumber while it is being stored and cured, then later, emerge from the finished product. Old items of furniture and wood antiques are especially vulnerable to attack by the lyctid powderpost beetles. A certain sign of their presence is numerous small holes about 1/16-to 1/8-inch in diameter and a fine, powder-like sawdust in flooring, paneling, furniture, and other wood materials. The dust results from the boring of the larvae. The holes are the openings through which the adult beetles emerge. Damage is done by the powderpost beetle larvae as they create narrow, meandering tunnels in wood as they feed. Infestations are discovered after noticing small, round “shot-holes” in the wood surface. These are exit holes where adult beetles have chewed out of the wood after completing their development. Newly-emerged adult powderpost beetles mate and lay eggs on or below the surface of bare (unfinished) wood. The powderpost beetles eggs hatch into tiny larvae which bore into the wood, emerging as adults 1-5 years later, usually during April – July. Homeowners are more likely to see damage than the powderpost beetles, themselves, because the adults are short-lived and are active mainly at night. The key to avoiding serious problems with Anobiid powderpost beetles is early detection and control. Usually, homeowners see the damage rather than the beetles. The larval damage occurs entirely below the surface of the wood, where larvae eat tunnels. This damage is not usually seen until the wood disintegrates. Lyctid powderpost beetles prefer the sapwood of oak and other hardwoods and many of the insects will continue to breed in an infested piece of wood for generations. This practice can result in an ultimate destruction of the wood. Infestations are most often found in wood paneling, molding, window and door frames, plywood, hardwood floors, and furniture. Imported tropical hardwoods are especially prone to lyctid powderpost beetles attack because of poor storage and drying practices prior to shipment to this country. Articles made of bamboo also are commonly infested. Rafters, joists, studs and other structural framing of homes are not normally attacked by lyctid powderpost beetles since these wood members are almost always constructed from pine or other softwoods. Lyctid powderpost beetles rarely infest wood older than five years. 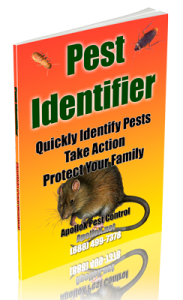 Thus, infestations generally are encountered in new homes or newly-manufactured articles. In almost all cases, infestation results from wood that contained eggs or larvae at the time it was placed in the home. This is significant because responsibility for damage/replacement often resides with the builder, cabinet maker or furniture manufacturer rather than the homeowner. Typically, the infested article was constructed from wood which was improperly dried or stored. Powderpost beetles damage wood slowly, so there is plenty of time to make a decision on control options. Most powderpost beetles problems are introduced into homes in lumber or finished wood products such as furniture, paneling, or flooring. Most serious infestations occur when infested wood is installed in the house. Inspect wood to insure that wood is not infested at the time of home construction. It is important to be able to determine whether the powderpost beetles infestation is active or inactive. Active infestations will usually have powder the color of fresh-cut wood sifting from the exit holes. In contrast to old, abandoned holes, new holes will not have taken on the weathered appearance of the surrounding wood. Powder streaming from recently opened holes may accumulate in small piles beneath the exit holes. If these piles of powder are covered over with a film of dust or debris, the damage is old. Careful observation may be required to distinguish new powder from frass which has been dislodged from old larval galleries by vibrations. One final means of confirming that a powderpost beetles infestation is active is to mark or seal any existing exit holes, sweep or vacuum up all powder, and recheck the wood for new holes and powder at a later date. Since most powderpost beetles emergence occurs from April-July, it might be worthwhile to wait until the following spring/summer to determine if new holes and fresh powder are present (this is especially true when attempting to make a determination during the fall or winter). Kiln-Dry The Wood: Rough-cut lumber should be kiln-dried to kill all stages of the powderpost beetles. Keep the Wood Dry: Since wood moisture levels below 13% (during spring and summer) are generally unsuitable for anobiid powderpost beetles development/re-infestation, it’s advisable to install a moisture barrier in the crawl space of infested buildings. Covering the soil with 4-6 mil polyethylene reduces movement of moisture into the substructure and reduces the threat of an infestation spreading upwards into walls and upper portions of the building. Another way to lower wood moisture content in damp crawl spaces is to increase ventilation. This can be accomplished by installing foundation vents (1 square-ft of vent area per 150 square-ft of crawl space). Moisture meters, used by some pest control operators, are useful tools for predicting the re-infestation potential of powderpost beetles in wood. Seal the Wood: Un-infested wood which is sanded and varnished will not normally be attacked by the adult powderpost beetles because they cannot find crevices in the wood surface into which they would deposit their eggs. Powderpost beetles emerging from finished articles such as furniture were usually in the wood before the finish was applied. Powderpost beetles emerging from finished wood can re-infest by laying eggs in their own exit holes; sealing the holes prevents this possibility. Store the Wood Safely: Items of value should not be stored in out buildings such as barns and sheds. These buildings are often infested with powderpost beetles. Don’t Use Infested Wood: Lumber which has been improperly stored or dried should not be used, particularly if powderpost beetles exit holes are present. Many of the most serious infestations of powderpost beetles result from people using old lumber from a barn or woodpile behind their house to panel a room or build an addition. Check Wood for Exit Holes: If you purchase an item with numerous holes (such as an antique), demand that the dealer provide you with a receipt from the company that performed the powderpost beetles fumigation.